Members of the mint family can be recognized by the combination of a square stem and aromatic leaves, both of which garden sage has. No other plant family has square stems and aromatic leaves. Flowers of all mint family plants are similar in structure, if you look closely. In the US, sage is also the name of a group of native plants, also called sagebrushes or sageworts. These are plants in the genus Artemisia, a large genus in the daisy and ragweed family, Asteraceae (also called Compositae). 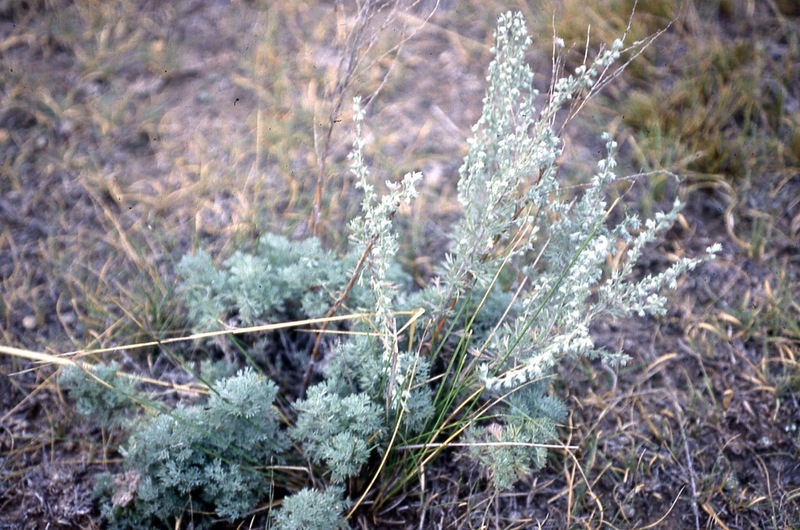 Common American artemisias include prairie sagewort A. frigida. big sagebrush, A. tridentata, and Louisiana sagewort, A. ludoviciana. 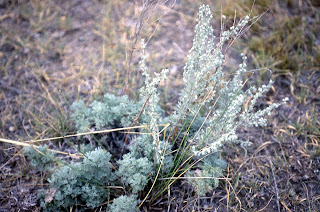 There are 37 species of Artemisia native to the lower 48 states, and another 7 in Canada and Alaska. They are herbs and low shrubs of dry regions with aromatic leaves, some pleasant to smell, some not. Like other members of the aster family, what looks like a flower is actually a group of tiny flowers. The artemisias are wind pollinated, so the flowers are inconspicuous and usually the color of the leaves. (Note that, although the leaves are aromatic, the stems are not square). Garden sages’ closest relatives are mints, prairie sages’ closest relatives are ragweeds and asters. Probably settlers called the American plants sages because the leaves of many species smell similar to garden sage. The curious thing, in addition to the name confusion, is that America has other close relatives (members of the same genus, congeners) of the European sages and Europe has other congeners of the American sages. 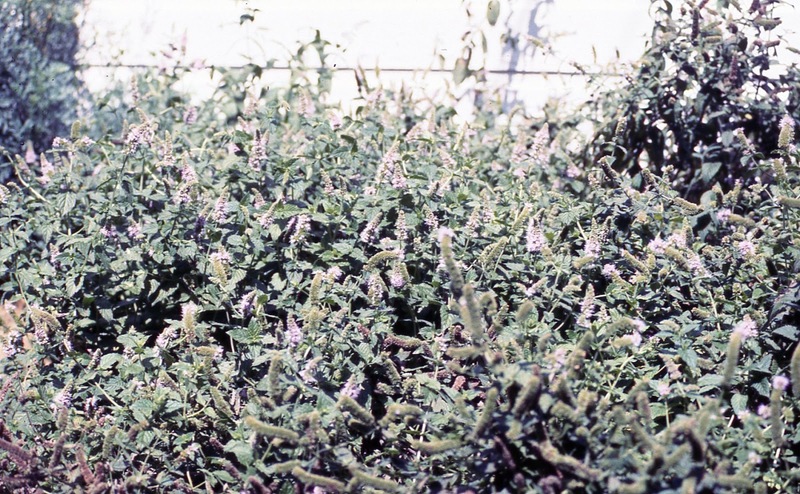 In America, closely related to garden sage are at least 47 native Salvia species (out of at least 959 worldwide). None of the American species are eaten as far as I know, but they are attractive plants and are frequently planted. Among those available to gardeners are Salvia azurea, azure blue sage, native to the plains states, and, from the U.S. Southwest Salvia farinacea blue salvia, Salvia dorii purple sage, and S. arizonica indigo blue sage. In Europe, closely related to the artemisias of the America plains and deserts are a series of important culinary or medicinal herbs, in particular wormwood Artemisia absinthium, mugwort, A. vulgaris, and southernwood A. abronatum. An Asian artemisia, Artemisia annua, called sweet Annie or sweet sagewort in English and qinghao in Chinese is widely used in Chinese medicine. North American tribes used the American Artemisia species in their regions for medicine so using an American Artemisia in a recipe that calls for sage is probably not a good idea. While I can find no reports of sagebrush poisoning of people, they are not considered safe to eat. I’d advise using the wild American sagebrushes and sageworts for incense and putting garden sage on your chicken. Gruenwald, J., T, Brendler and C. Jaenicke, editors. 2007. PDR (Physician’s Desk Reference) for Herbal Medicines. 4th edition. Thompson Healthcare Inc, Montvale, NJ. Kershaw, Linda. 2000. Edible and medicinal plants of the Rockies. Lone Pine Publishing, Edmonton Alberta. Kindscher, Kelly. 1992. Medicinal wild plants of the prairie. University of Kansas Presses, Lawrence KS. Lewis, Walter and Memory Elvin-Lewis. 2003. Medical Botany. 2nd ed. John Wiley and Sons, Inc., New York. Animals eat sagebrush. I really can't imagine that it's poisonous. I have used dry, powdered sagebrush to make meat less gamey. I'll let you know if I die. Of course you'll die. Probably not from using sagebrush as a spice. But animals eat things we can't and vice versa. The sagebrushes are a big group of which many are important medicines. 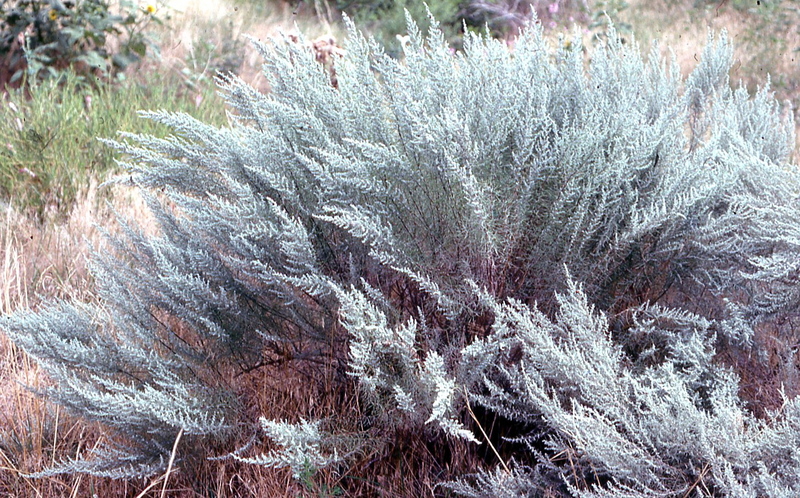 Some Native American tribes used some species of sagebrush (Artemisia) as spices; more tribes used more species as medicines (see Moerman Native American Ethnobotany). Know what plant you are eating, because it is not culinary sage. Can you burn white sagewort instead of buying white sage to burn in your home? I have the sagewort growing abundantly around our home in the fields, so it's free but would it do the same cleansing for a home? People do, frequently. I do not know enough about smudging myself to say. Perhaps you should try it and see if you think it effective. I grow Common Sage and garden Sage. I love place in the garden and their healing.